Eventually, however, he has to learn the truth. When his grandmother dies, he is called upon to take a prominent part at her funeral and, with it, his place among the men of the village and his father, who had been horribly strict with him by Western standards (once his mother comes between the two, remonstrating with her husband that “He’s not your wife that you can beat him"), explains that “I was as strict with you as I would have been with my own son, because I wanted you to be a good man.” He further affirms his advance on adulthood by beginning to court a pretty girl in the accepted local fashion by giving her a ride on the crossbar of a borrowed bicycle. This is about all that happens in the movie, and I should warn those who are unfortunately attached to their appetite for seeing things happen in movies that this one will provide them with a pretty thin gruel. 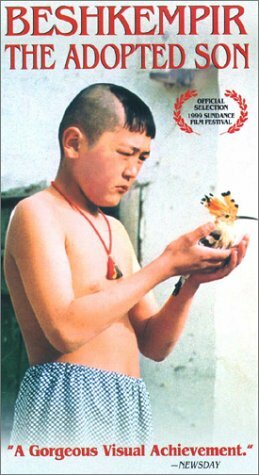 In its favor, however, I would urge that its recording of the rhythms of life in the vast expanses of rural Central Asia are well worth the watching. We see people making bricks from mud and straw and winnowing grain in the wind, two of the most basic and ancient of agrarian pursuits that continue in Kyrgyzstan little changed from what they have been for thousands of years. In addition we see these peasants, whom it hardly occurs to us to call "poor," though of course they are, pruning fruit trees, sewing, making reed mats, and fishing. When Beshkempir is called to the bedside of his dying grandmother, we have just seen him wading in a muddy stream, driving fish to the nets some distance away. Then we see the roe being cut out of the fish and put in a bucket. In this context, Beshkempir's own passage from childhood to adulthood takes on an added dimension of meaning. Most of the film consists of scenes in which the boy is running wild and getting into innocent sorts of mischief (stirring up bees' nests, spying on a fat woman who is applying leeches to her naked torso) with his friends—doubtless because he simply has no opportunities like those afforded to American youths of gunning down pizza delivery men with 9mm handguns for pocket-money. But the presence in the background of constant reminders of the uneasy collaboration, by which life is sustained, of adult effort and the indulgence of nature at its most stark and majestic helps to prepare us for the scenes in which he must accept his new place of dignity and responsibility in the village. Like his father's unexpected assurance of love, life comes to Beshkempir as an uncovenanted grace, and is the more to be treasured therefore.